It was the first ever exhibition of Fra Angelico’s works in France and the Musée Jacquemart-André was able to acquire almost 25 pieces for the show. This was quite a feat considering Fra Angelico’s fragile works are very rarely transported. 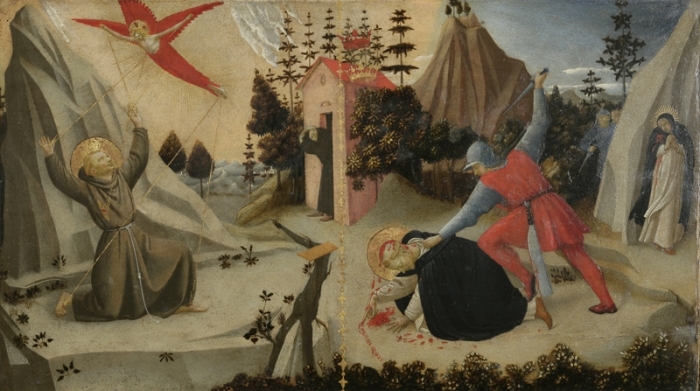 Along with Fra Angelico there were works by his fellow monk and teacher, Lorenzo Monaco, as well as Masolino, Gentile da Fabriano, Lippo Lippi, Paolo Uccello and his student Benozzo Gozzoli. Through Fra Angelico and these exceptional painters we are able to understand the progession of artistic development which occurred in Florence during the first half of the 1400s. As masterful as he is in portraying paintings worthy of deep religious contemplation and meaning, Fra Angelico was a leading thinker and technician in the new and innovative approaches of image making. In his ability to show perspective and form we can see the leap that Fra Angelico made over the generation of artists preceding him in Florence. 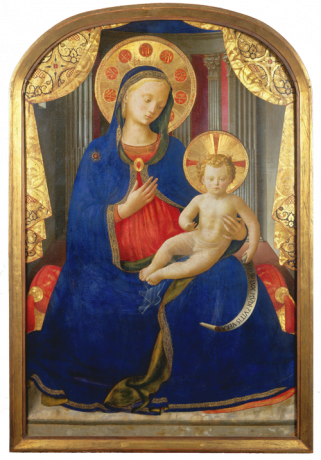 We get a sense of this in two cases, where Fra Angelico treats similar subjects as Gentile da Fabriano and Lorenzo Monaco, both masters in the school of International Gothic painting. 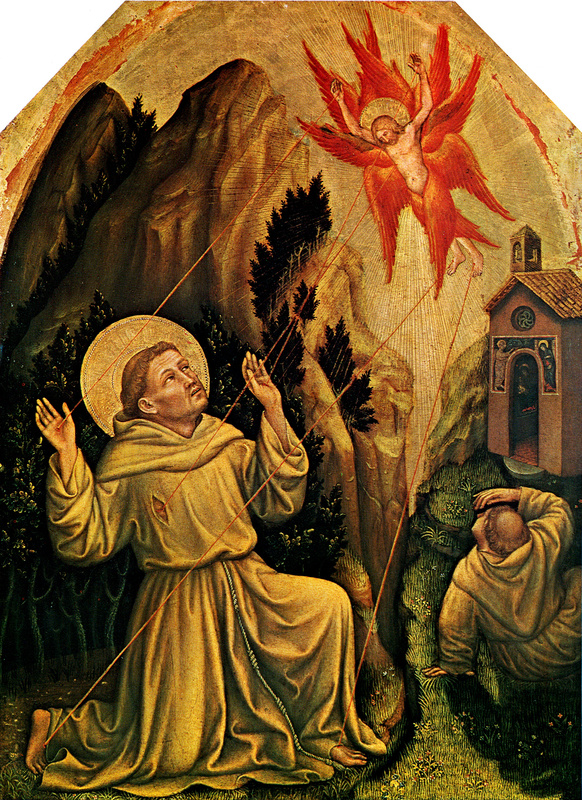 In the depiction of Saint Francis receiving the stigmata, Fra Angelico is able to covey much more space and form than in Gentile da Fabriano’s version. Exhibited side by side in the show, Lorenzo Monaco’s “Miracle of Saint Nicholas” and Fra Angelico’s “Thebaide” are quite astonishing in illustrating the contrast and progression in portraying sea and landscapes. Monaco’s depiction of the sea is as a pattern made up of spirals. Fra Angelico conveys a real sense of depth in the the gradations and the changes in scale and detail. 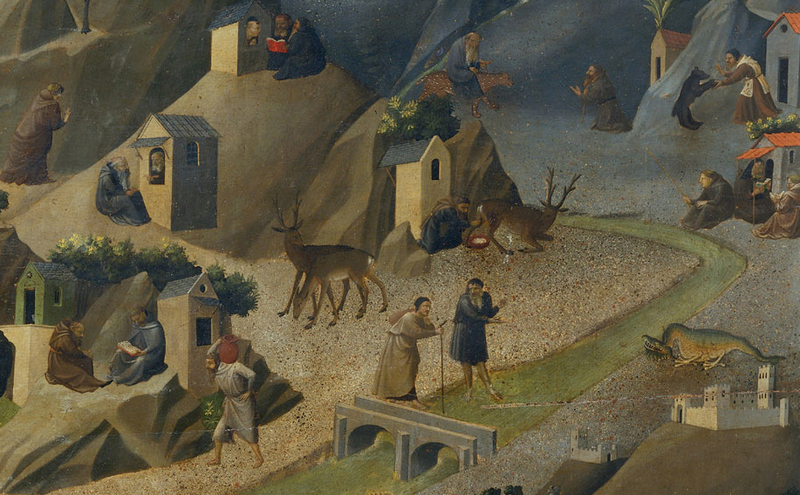 Regarding Thebaide, it is remarkable how Fra Angelico was able to paint so much in such a small space, from monks praying and reading, beautiful naturalistic animals, light falling on plants and trees, to the texture of the earth, which Fra Angelico achieved by using a pointillist approach. We also find that Fra Angelico delves deeper than his contemporaries in exploring the uses of new artistic innovations. 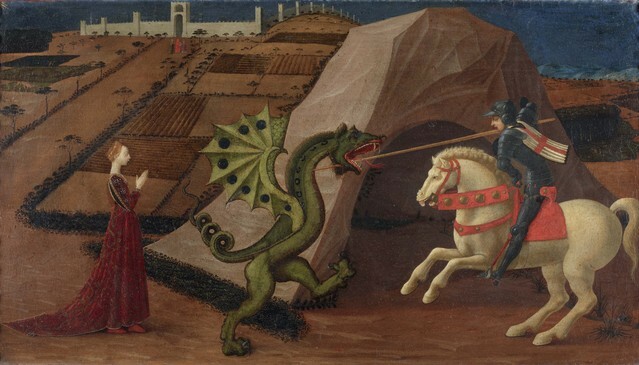 Taken from the museum’s permanent collection the use of perspective in “Paolo Uccello’s Saint George and the Dragon” is effective but a bit arbitrary to the main subject. 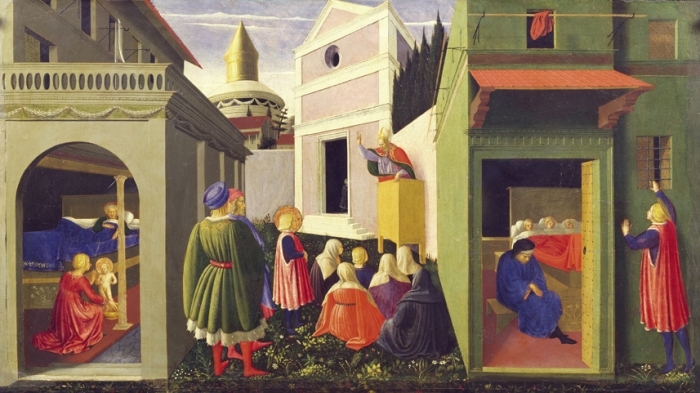 On the other hand, in “The Story of St. Nicholas,” Fra Angelico uses linear perspective as a means to intertwine three narratives in a coherent manner. 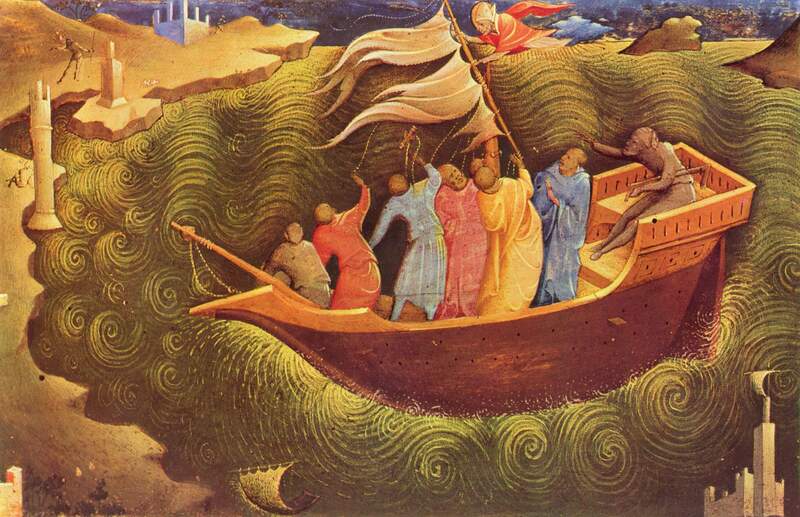 For Fra Angelico, perspective is a useful tool to amplify his intentions, whether it is a narrative or an idea. 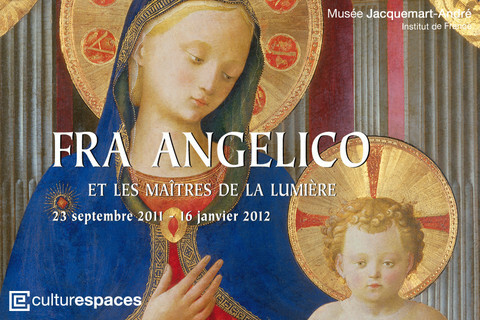 The exhibition is called “Fra Angelico and the Masters of Light” and it is an apt title. 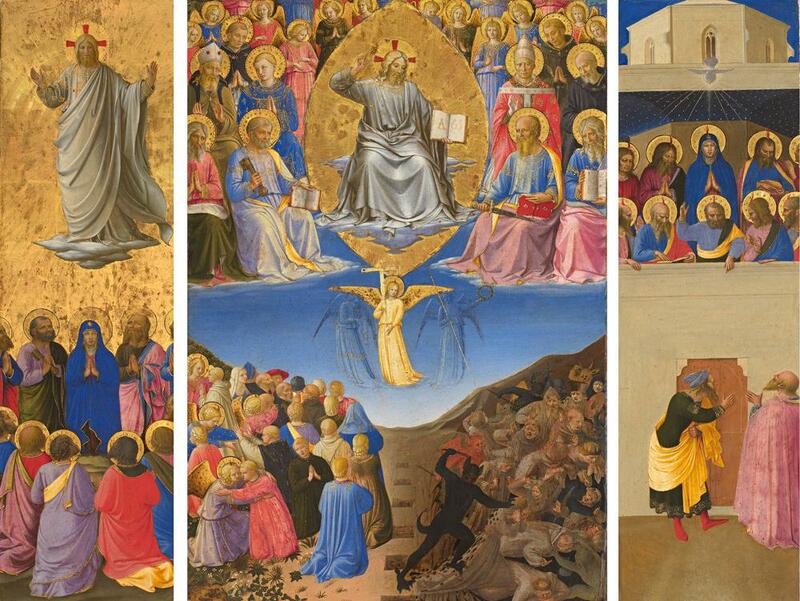 Fra Angelico’s paintings are rich with color, light and gold. Fra Angelico was a master of gold leaf. In his “Virgin and Child” we notice not just the gorgeous designs and patterns in the haloes but the way the gold curtain turns and folds in his magnificent tooling of the gold. Light permeates Fra Angelico’s paintings in his use of color. When colors go in to shadow they never get too dark, only more pure in their hue. Each color is distinct, pure and balanced throughout the painting. There is a mosaic quality in some of Fra Angelico’s busier paintings where figures are cut out from one another by the offset of colors. 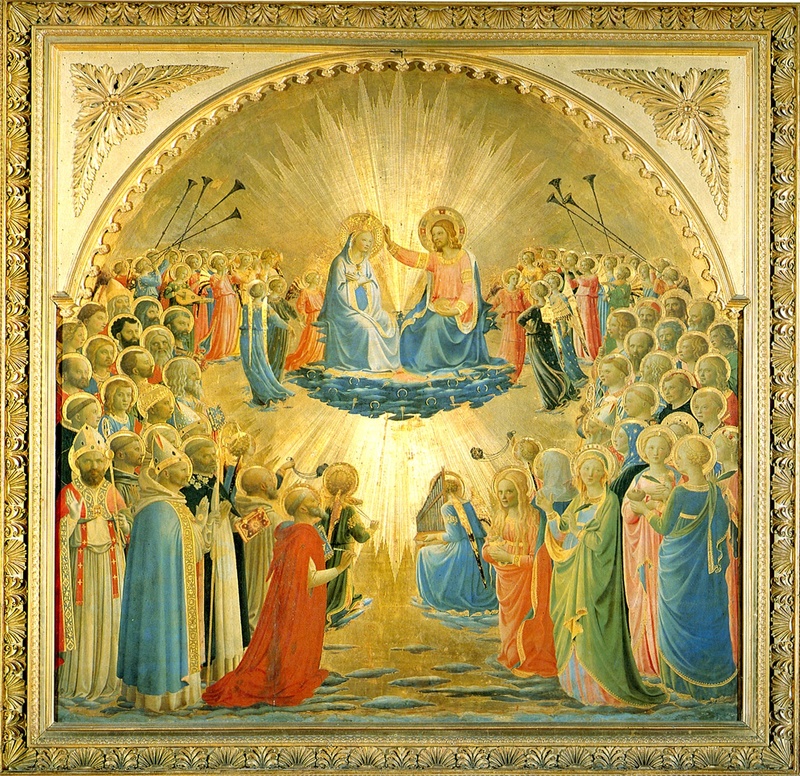 This is visible in the triptych “The Ascension, The Last Judgement and the Pentecost” where through a balance of pinks, blues, reds and golds each figure is clearly delineated and the composition remains balanced. I found this painting to be captivating for many reasons, especially the solidity and beauty of Christ, in particular the drapery over his legs as he pronounces the Last Judgement. At the end of the exhibition we find a video showing the works at the monastery in San Marco. Frescoed on the walls in each cell are scenes from the life of Christ. There is a sobriety and gravity to the images and we are reminded of the religious sentiment and conviction in Fra Angelico’s work. Perhaps this is why his paintings are so moving; with all his technical know-how we still find a sweet simplicity and clarity in his panels and frescoes. Fra Angelico’s works do reflect the intellectual achievements of his age but ultimately it is the pureness and deep spirituality in his own heart that makes his work so moving and unforgettable. You are currently browsing entries tagged with artist at The Chronicle.